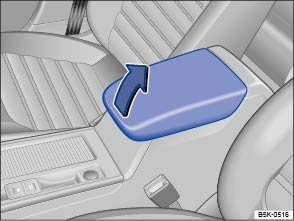 To open, pull the centre armrest all the way up in the direction of the arrow . To close, guide the armrest down. Never transport an adult or child on the centre armrest. You will find a telephone holder and a USB port for mobile telephone provision ⇒ Bookletnavigation system, or ⇒ Bookletradio, navigation system, . A factory-fitted CD changer may be located in the stowage compartment.